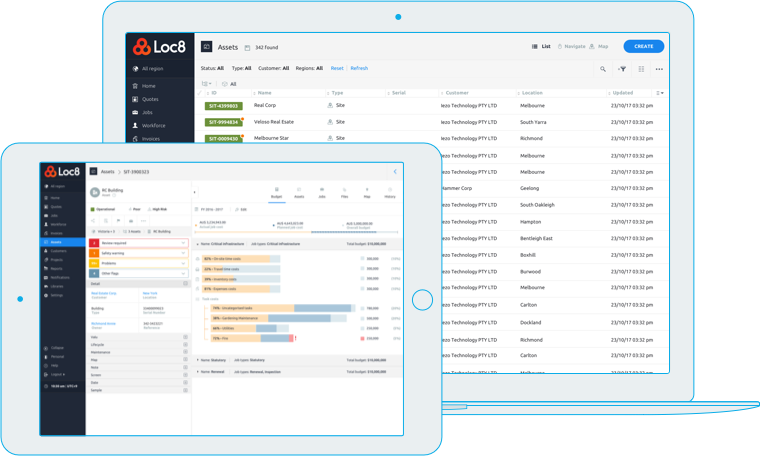 Take control over all aspects of Asset Management with Loc8. Loc8’s highly functional and intuitive Asset Management capabilities will allow you to align your business to best practice Asset Lifecycle Management policies and processes. Therefore, ensuring the continuing high-level function and optimum performance of all assets under management. The Asset Management and Asset Lifecycle Management features in Loc8 provide the cornerstone of the system, integrating tightly with preventative and reactive maintenance, job management, reporting and integrations capabilities. Along with other innovative Asset and field- workforce Management features, Loc8 enables users to take control over all aspects of Asset Management providing visibility and insights related to important measurement metrics. But also gives information on statuses such as asset condition, critical infrastructure, lifecycle, risk, warranty, maintenance cycle, expected renewal dates and associated budgeting components. In summary, Loc8’s powerful Asset Management and Asset Lifecycle Management features enable businesses to gain greater visibility, insight and control over all Assets, their location, performance and condition to improve planning and decision making.